Serving Southern Ontario since 1991, we offer a variety of finishes for your polished concrete floors, concrete driveways and concrete countertops. Concrete floors are low maintenance and easy to care for. Mopping your floor every once and a while with warm soapy water will keep your floor clean and well maintained. Concrete countertops are harder and stronger than regular concrete and sealed in order to prevent staining. We recommend cleaning any spills as soon as possible. Don't settle for ordinary. Create a stunning concrete driveway for your home with concrete. Available in many different stamped finishes. 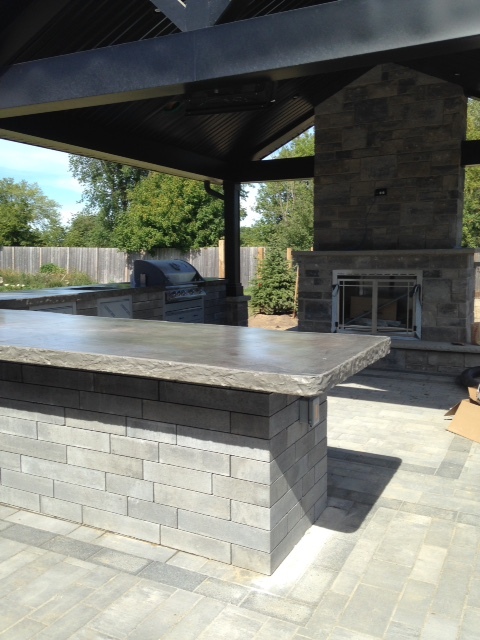 We offer many concrete services, including concrete floors, concrete countertops, driveways, fireplaces, tabletops, outdoor kitchens, stair treads, concrete polishing, stamped concrete and more. We pride ourselves on seamless concrete work achieved by pouring on-site. Our portfolio includes not only our renowned concrete countertops, but also includes concrete floors, stamped concrete as well as polished concrete and concrete fireplaces. They are a sustainable design flooring option that will not chip or dent like hardwood floors, and will not become dirty like carpet. A concrete floor that has been hardened and polished will last for a very long time compared to other flooring options. Whether you are looking for your home or business we have completed concrete floor projects across North America, for both residential and commercial, large or small jobs.